All other knives on this web site are already sold and in the hands of their new owners. They are here for reference only! I do my best to keep my web site up-dated, and arranged for your convenience. 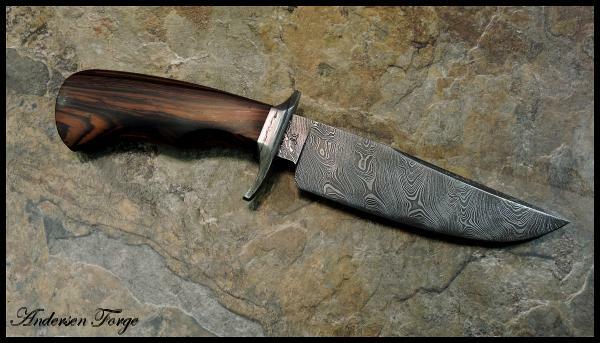 This is one of the knives I took this year to the Little Rock, Arkansas Knife Show in the first year of it being under new management and promotion. Some - and old - aspects of the show are quite interesting. Firstly, the show was converted to a one day format. Yep - just one day to find the knives you wanted and get the purchase done. No coming back on day two. I came home with two knives and this is one of them. The other is already sold. 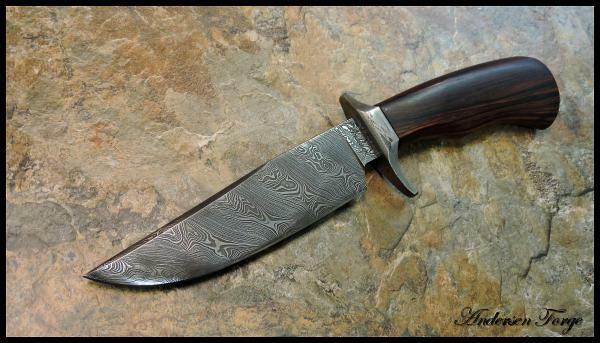 This knife was forged brom a billet of my Single Twist Damascus. It is a 6 1/8" blade. The guard is from my stash of 1903 wrought iron and was deeply etched to reveal the cool nature sought from wrought iron. The handle is a fabulous piece of Cocobolo. It was built as a take-down and I covered the finial with a decorative piece of Black Linen Micarta. Sold with sheath, Certificate of Authenticity and zippered case. The price listed on Knives For Sale may change slightly depending upon payment method and shipping requirements. Please DO NOT simply send payment without first contacting me regarding ALL arrangements. Please keep in mind I am a full time maker. I have an extensive order list from my customers. 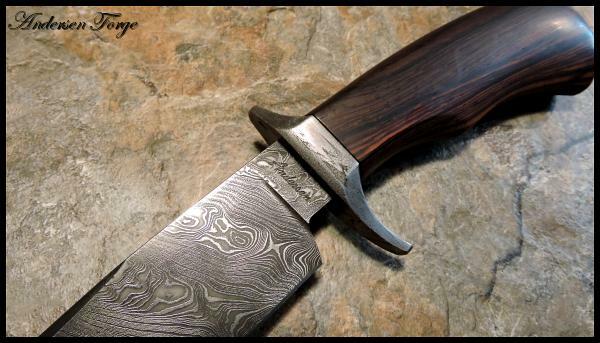 While I try to satisfy my customers' needs, I also have to make knives for knife shows, as well as attempt to keep a knife or two for sale here. That is a huge demand of my time. Even when I try to get a knife for sale here, the first people to see it are the ones on my mailing list. Those knives are usually bought up before they ever make it to this page. 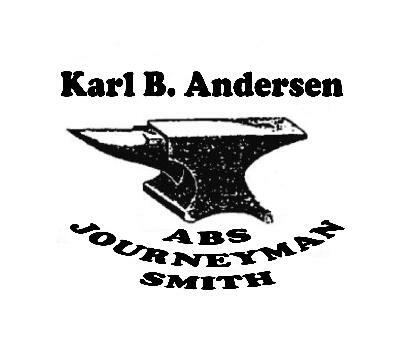 If you would also like the opportunity to purchase a knife from Andersen Forge, feel free to contact me to get on my mailing list.